Mon., April 4, 7 p.m.: Nosferatu, part of BAMcinématek and Unsound New York Labs, plays at BAM, with live music by Svarte Greiner and Paul Wirkus. (Directed by F.W. Murnau, with Max Schreck, Gustav von Wangenheim, Greta Schröder (1922) 94min. As part of Unsound New York Labs, a series of intimate events focusing on cross-border collaboration and live experimentation, BAMcinématek screens Murnau’s expressionistic horror classic Nosferatu with a live score by Norwegian Svarte Greiner, creator of “acoustic doom”, as well as the founder of the celebrated Miasmah label, along with Polish/German percussionist Paul Wirkus. Unsound New York Labs is presented by Fundacja Tone, the Polish Cultural Institute in New York and the Goethe-Institut New York. Murnau’s Expressionist masterpiece—the first and most poetic vampire film ever made—features one of cinema’s all-time creepiest performances in Max Schreck’s otherworldly turn as the lurking, bloodsucking Count Orlok. 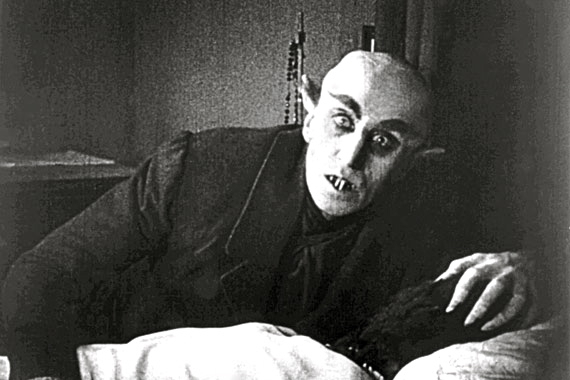 An unauthorized adaptation of the Stoker novel,Nosferatu is remarkable for Murnau’s mastery of atmosphere (the ethereal, haunting landscapes) and stylistic experimentation (time-lapse and negative photography), as well as the powerful sexual undercurrent that posits the vampire figure as both fearsome and desired. The one-man project of Berlin-based Norwegian Erik K. Skodvin, Svarte Greiner is an intense exploration into a dark, mysterious, and disturbed universe. Drawing inspirations from artists such as Earth, Volcano the Bear, David Darling & Deathprod, the output of Svarte Greiner is draped in David Lynch inspired mysticism. Since the release of his drone-laden debut album “Knive”–a record called “a milestone in doom music”–the influence of horror films has been a constant current in his music. Since this debut, Skodvin has built a distinctive live technique using an unusual collection of broken glove puppets and potion-filled medicine bottles. Since the late 90s Wirkus has emerged both as solo performer (electronics, drums) and with several projects ranging from modern improv to minimal electronica. Apart from solo releases such as “Inteletto d’Amore” and “Déformation professionnelle” Wirkus has collaborated live and on CD with musicians of various musical backgrounds, e.g. Barbara Morgenstern and Stefan Schneider (To Rococo Rot) with whom he formed September Collective, Ekkehard Ehlers, and Johannes Frisch (Kammerflimmer Kollektief) who has joined Wirkus in the free jazz trio Wirkus/Trzaska/Frisch. Wirkus is also part of the drummer duo Moretti/Wirkus. In cooperation with The Trust For Mutual Understanding, The Adam Mickiewicz Institute, City of Krakow, Krakow Festival Office, 6 Zmyslów, Austrian Cultural Forum New York, Instituto Cervantes de New York, Czech Center New York, Consulate General of Finland in New York, Royal Norwegian Consulate General in New York, Pro Helvetia, Backspin Promotions, BAM Cinemateque, Bedroom Community, Beyond Booking, The Bunker, The Blackened Music Series, Electronic Music Foundation, European Cities of Advanced Sound, FRKWYS, International Cities of Advanced Sound, Issue Project Room, Kiss&Tell, (le) Poisson Rouge, Littlefield, Goethe-Institut Wyoming Building and others.